As part of the Chamber's District Indicators Project, a 3-year economic study (2015-2018) to provide decision-makers with actionable economic data, the Chamber releases yearly Tech Trends Report – a wide-ranging effort to track the growth, trends, and characteristics of Oakland's tech sector. Read or download Tech Trends Report 2018 here. Read or download Tech Trends Report 2017 here. 2016 Oakland Tech Trends Report Released September 2016. 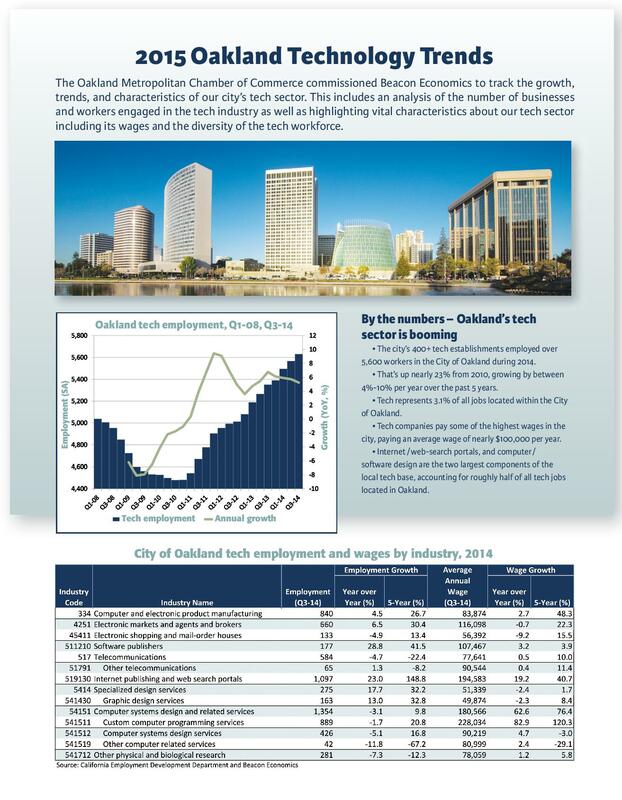 This report focuses on the trends shaping Oakland's rapidly growing tech sector, from the core tech clusters of Internet publishing and web search portals, to custom programming services, to subsectors related to online business and shopping. The report notes some 446 tech companies, 230 of which employ more than 3 workers, are responsible for employment in the sector in excess of 6,100 workers in 2015. A capacity crowd joined turned out for the second event in the Chamber’s 'Oaklanders Talk Tech' series held December 8, 2015. With leading venture capitalists and tech luminaries as panelists, the event featured discussions on amplifying investing and local innovation — while growing Oakland's emerging tech sector in quintessential Oakland style. At the event, the Chamber announced an update to its Tech Trends report, which can be found here.